Jim graduated from the University of Waterloo’s School of Optometry in 1982. Fate immediately directed him away from his roots in the Ottawa Valley (Renfrew) and made Kingston "home". Until Bayview Optometry, he worked in centre town at the St. Lawrence Optometry Clinic group practice. He has maintained a general practice with unofficial desire to help special needs patients of all kinds. He is not a low vision, contact lens, binocular vision or other "specialist", but he always tries his best to help these people – if he can’t, he’ll find out who can. Jim is qualified for ophthalmic drug therapy treatment and has been an active examiner in the clinical portion of the CSAO (Canadian Standard Assessment in Optometry) professional entrance examinations. He and his wife, Janice, have two children: James and Erin. Golf, curling, skiing and mountain biking are special leisure interests. Beth was raised in Kingston and has practiced in this area since her graduation from UW, Optometry in 1997. Prior to receiving the O.D. degree, she also earned a BSc in Biochemistry (UW). As an optometrist, she initially worked with St. Lawrence Vision Centre before establishing her own solo practice in Amherstview in 2002. Beth is qualified for ophthalmic therapeutic drug practice and has been an active associate optometrist with Focus Eye Centre. She has also volunteered as a regular CSAO clinical examiner. Beth is married to Jake and they have two fiery young boys, Tiernan and Nolan. As you might expect, children currently keep her quite busy but golf and exercise remain favourite escapes. Following the completion of a Bachelor of Science degree, Alyssa graduated from the University of Waterloo School of Optometry (Dean's Honour List, 2012). Academic training included an externship with an anterior segment and cataract ophthalmology specialist in Bethesda, Maryland. 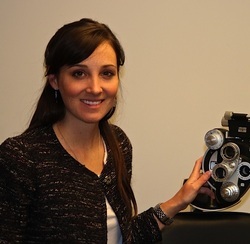 Alyssa now enjoys full-scope optometry practice and is trained in ophthalmic therapeutic drug disease management. Following graduation, Alyssa began work in the Belleville-Quinte Region prior to moving to Kingston to join the Bayview Optometry team. She considers herself fortunate to have been selected to participate in volunteer eye care missions in Romania and Thailand providing ophthalmic services to those in need. In her free time, Alyssa enjoys ultimate Frisbee, golf, synchronized skating and travel. Solange Lacroix received her Doctor of Optometry degree from the University of Montreal School of Optometry in 2017. She completed an externship in ocular disease at the Eye Centers of South Florida. Dr. Lacroix is pleased to offer the diagnosis and management of ocular diseases, contact lens fittings, as well as eye exams for patients of all ages. She is certified in Therapeutic Pharmaceutical Agents and offers comprehensive eye examinations in both English and French. Solange is a past president of the Canadian Association of Optometry Students and she has volunteered with an optometric humanitarian mission to Peru. Solange is excited to have moved back to her hometown of Kingston. She loves spending her time playing the violin and participating in outdoor activities including sailing and kitesurfing.